The newly emerged Middle East respiratory syndrome coronavirus (MERS-CoV) that first appeared in Saudi Arabia during the summer of 2012 has to date (20th September 2013) caused 58 human deaths. MERS-CoV utilizes the dipeptidyl peptidase 4 (DPP4) host cell receptor, and analysis of the long-term interaction between virus and receptor provides key information on the evolutionary events that lead to the viral emergence. We show that bat DPP4 genes have been subject to significant adaptive evolution, suggestive of a long-term arms-race between bats and MERS related CoVs. In particular, we identify three positively selected residues in DPP4 that directly interact with the viral surface glycoprotein. Our study suggests that the evolutionary lineage leading to MERS-CoV may have circulated in bats for a substantial time period. Middle East respiratory syndrome coronavirus (MERS-CoV) , first described by the World Health Organization (WHO) on 23rd September 2012 [2, 3], has to date (20th September 2013) caused 130 laboratory-confirmed human infections with 58 deaths (http://www.who.int/csr/don/2013_09_20/en/index.html). MERS-CoV belongs to lineage C of the genus Betacoronavirus in the family Coronaviridae, and is closely related to Tylonycteris bat coronavirus HKU4 (BtCoV-HKU4), Pipistrellus bat coronavirus HKU5 (Bt-HKU5) [4, 5] and CoVs in Nycteris bats , suggestive of a bat-origin . Unlike severe acute respiratory syndrome (SARS) CoV which uses the angiotensin-converting enzyme 2 (ACE2) receptor for cell entry , MERS-CoV employs the dipeptidyl peptidase 4 receptor (DPP4; also known as CD26), and recent work has demonstrated that expression of both human and bat DPP4 in non-susceptible cells enabled viral entry . Cell-surface receptors such as DPP4 play a key role in facilitating viral invasion and tropism. As a consequence, the long-term co-evolutionary dynamics between hosts and viruses often leave evolutionary footprints in both receptor-encoding genes of hosts and the receptor-binding domains (RBDs) of viruses in the form of positively selected amino acid residues (i.e. adaptive evolution). For example, signatures of recurrent positive selection have been observed in ACE2 genes in bats , supporting the past circulation of SARS related CoVs in bats. To better understand the origins of MERS-CoV, as well as their potentially long-term (compared to short-term which lacks virus-host interaction) evolutionary dynamics with bat hosts [5, 10], we studied the molecular evolution of DPP4 across the mammalian phylogeny. We first analyzed the selection pressures acting on bat DPP4 genes using the ratio of nonsynonymous (dN) to synonymous (dS) nucleotide substitutions per site (ratio dN/dS), with dN > dS indicative of adaptive evolution. The complete DPP4 mRNA sequence of the common pipistrelle (Pipistrellus pipistrellus) was downloaded from GenBank (http://www.ncbi.nlm.nih.gov/genbank/) along with that of the common vampire bat (Desmodus rotundus) from one transcriptome database (http://www.ncbi.nlm.nih.gov/bioproject/178123). These sequences were then used to mine and extract DPP4 mRNA transcripts from a further five bat genomes (Table 1) using tBLASTn and GeneWise . 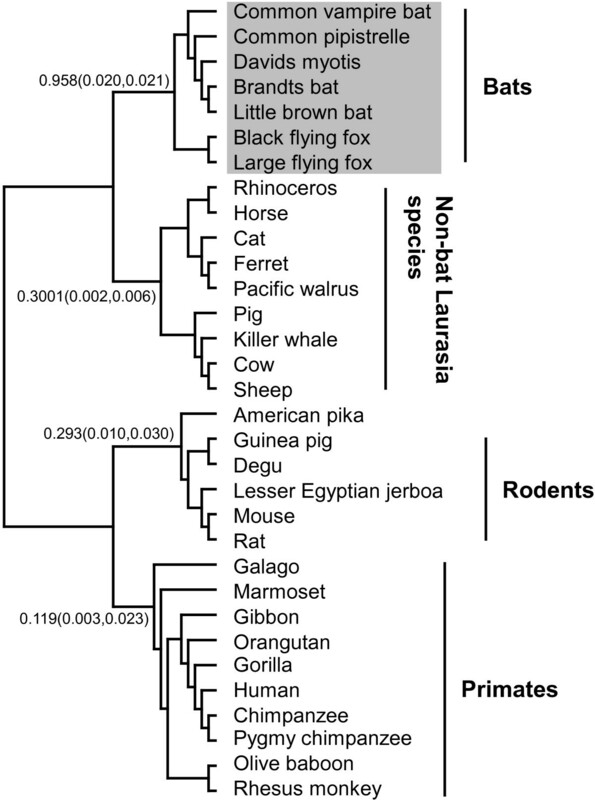 The complete DPP4 genes of bats and non-bat reference genomes from a range of mammalian species (Table 1) were aligned using MUSCLE  guided by translated amino acid sequences (n = 32; 727 amino acids). We then compared a series of models within a maximum likelihood framework , incorporating the published mammalian species tree [14–16]. This analysis (the Free Ratio model) revealed that the dN/dS value on the bat lineage (0.96) was four times greater than the mammalian average (Figure 1). The higher dN/dS ratios leading to bats (Table 2) during mammalian evolution accord with the growing body of data [5, 6, 17, 18] that the newly emerged MERS-CoV ultimately has a bat-origin. Selection pressures on DPP4 during mammalian evolution. Ratios of nonsynonymous (dN) to synonymous (dS) nucleotide substitutions per site (dN/dS) are shown on four major ancestral branches; dN and dS numbers are also given in parentheses. Values for individual lineages are given in Table 2. DPP4 sequences of bat origin are shaded. ND: Not determined because no synonymous substitutions are present. We next analysed the selection pressures at individual amino acid sites in bat DPP4. Using the Bayesian FUBAR method  in HyPhy package , we identified six codons that were assigned dN/dS > 1 with higher posterior probability (a strict cut-off of 95% in this analysis) (Table 3). To identify those sites under positive selection that may interact directly with MERS-CoV-like spike protein, bat DPP4 (from the common pipistrelle) was modelled against the structure of the human DPP4/MERS-CoV spike complex  (Figure 2A). This revealed that three of the six positive selected residues (position 187, 288 and 392) were located at the interface between bat DPP4 and MERS-CoV RBD (receptor binding domain) (Figure 2). These residues therefore provide direct evidence of a long-term co-evolutionary history between viruses and their hosts. We also observed several variable regions (Figure 2B) within the bat RBD, that may also have resulted from virally-induced selection pressure and which merit additional investigation in a larger data set. a Codon position corresponding to the human DPP4 (NP_001926) protein sequence. b Posterior probability of residues assigned a dN/dS ratio greater than 1. Interaction of bat DPP4 and MERS-CoV spike protein receptor-binding domain and the location of positively selected sites. The structure was displayed using PyMol v1.6 (http://www.pymol.org/). (A) Homology model showing the structural interactions between bat DPP4 (from common pipistrelle) coloured grey and MERS-CoV spike protein receptor-binding domain coloured blue. The three positively selected residues (positions 187, 288 and 392) located within the interface where the virus-host interact are highlighted as red. (B) Protein alignment of human DPP4 compared to that of seven bat species showing RBD spanning codons 41 – 400. Conserved and variable positions are shown in black and grey text, respectively, and residues under positive selection are coloured red. Our analysis therefore suggests that the evolutionary lineage leading to current MERS-CoV co-evolved with bat hosts for an extended time period, eventually jumping species boundaries to infect humans and perhaps through an intermediate host. As such, the emergence of MERS-CoV may parallel that of the related SARS-CoV . Although one bat species, Taphozous erforatus, in Saudi Arabia has been found to harbour a small RdRp (RNA-Dependent RNA Polymerase) fragment of MERS-CoV , a larger viral sampling of bats and other animals with close exposure to humans, including dromedary camels were serological evidence for MERS-CoV has been identified , are clearly needed to better understand the viral transmission route. Alternatively, it is possible that the adaptive evolution present on the bat DPP4 was due to viruses other than MERS-CoVs, and which will need to be better assessed when a larger number of viruses are available for analysis. Overall, our study provides evidence that a long-term evolutionary arms race likely occurred between MERS related CoVs and bats. We thank Christopher Cowled at CSIRO Australian Animal Health Laboratory for annotating the Pterous aleco DPP4. This word was supported in part by a grant from the National Research Foundation, Singapore (NRF2012NRF-CRP-001-056) and the CSIRO Office of the Chief Executive Science Leaders Award. ECH is supported by an NHMRC Australia Fellowship. JC and LFW designed the research. JC and JSE analysed the data. JC and ECH drafted the manuscript. All authors read and approved the final manuscript.